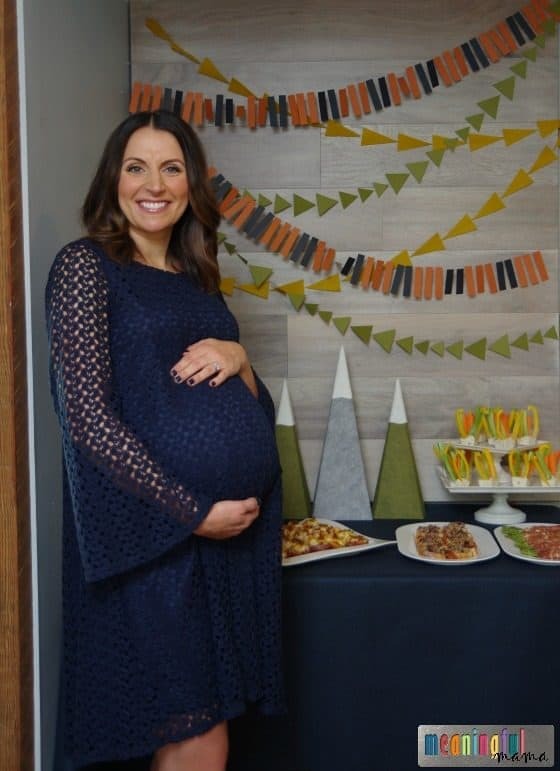 This mountain themed boy baby shower with tribal influence was how we recently celebrated the new life growing inside my sister-in-law’s belly. 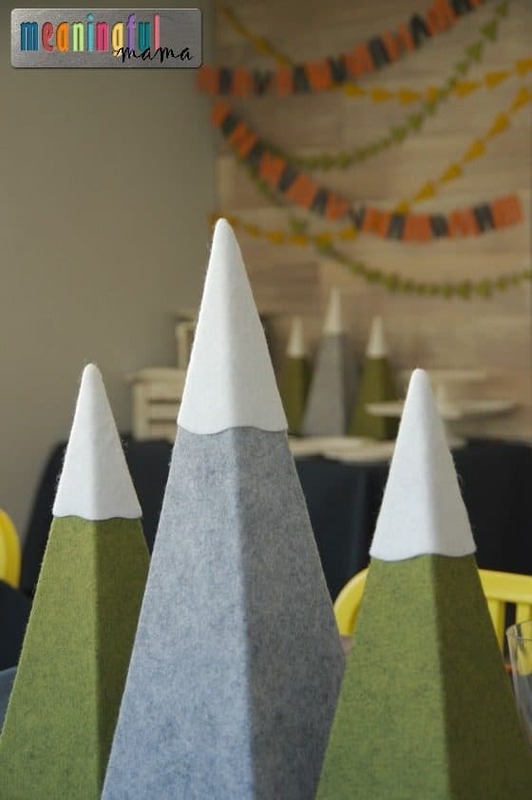 I’m very aware that a mountain theme isn’t necessarily what you would consider for a baby shower. However, my sister-in-law isn’t traditional in style. She is super fashion-forward and wouldn’t be excited about a shower decorated in all blue. Taking inspiration from her gray felt mountain pillows that will adorn her baby’s room, we decided to embrace the felt, the mountains and the yarn that so often wraps the gifts she gives. 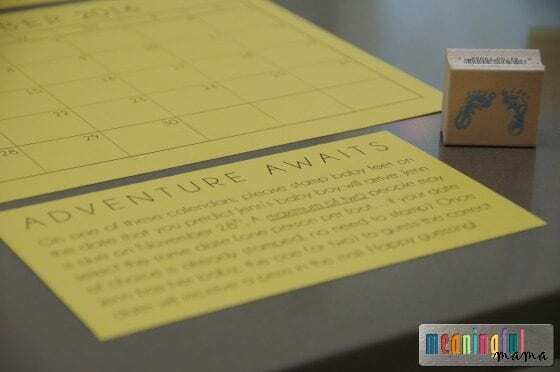 The theme, although unique, is fairly on trend. Tribal decor and fashion is all the rage right now. I’m sure seeing such great patterns and designs in the stores aided in our own motif inspiration. I will probably use the term “we” a lot while talking about this shower. I co-hosted with my other sister-in-law. We worked well as a team. I really focused on the food (coming soon) while she headed up the design. Of course, we were consulting each other and laboring together to make the big day happen. 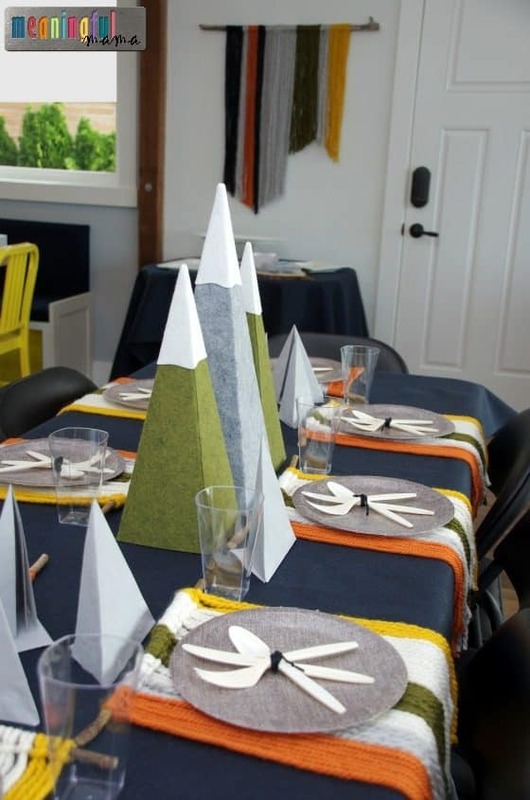 For both the food table and all of the table setting, we made these felt mountains. We purchased gray felt , cream felt and green felt. We also purchased cardboard pyramids found at Consumer Crafts. 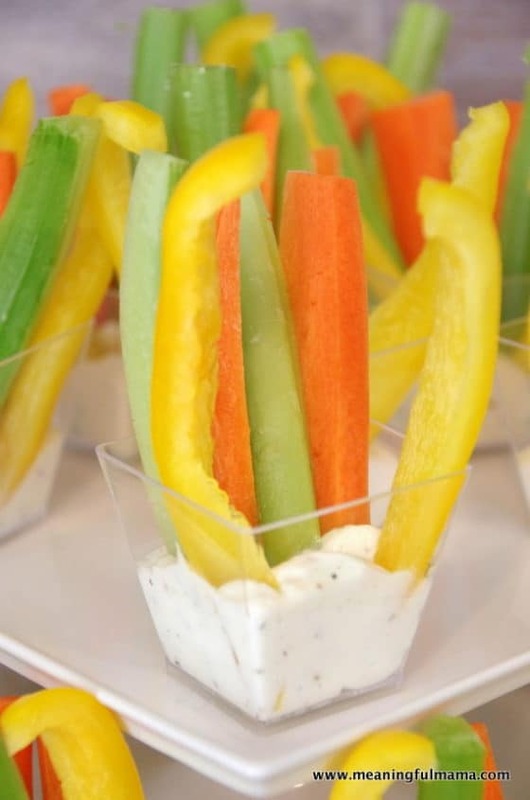 To make these you need to create a template. You do this by rolling the pyramid along the felt, keeping the point in the same location and drawing a line at each base. It’s a weird shape, and you might want to practice with scrap fabric at first. We used spray glue adhesive to adhere the felt to the pyramid. Simply spray directly onto the felt and then wrap around the pyramid, starting at one of the edges. It’s a little challenging to line up, and there might be a little overlap. You might want to allow for that. We found it easiest to trim with a rotary cutter . The background wall was actually created for this party. We used Armstrong flooring, and my husband attached the planks to two vertical boards. If I didn’t have so many woods already competing in my home, I would have kept the wall installation because I love it. Our garlands really added to the design. The green triangles are made of paper. So is the orange and navy blue. The yellow was made from felt. 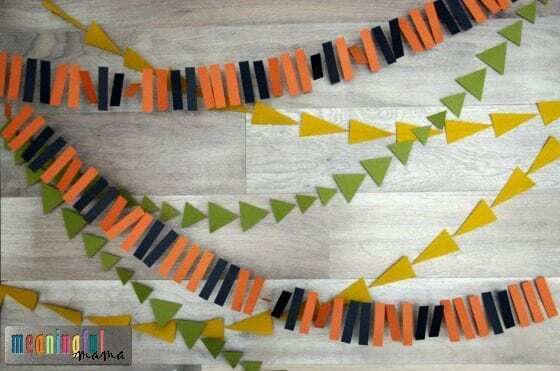 We were going to sew these garlands like I did with the paper circle garland found here. 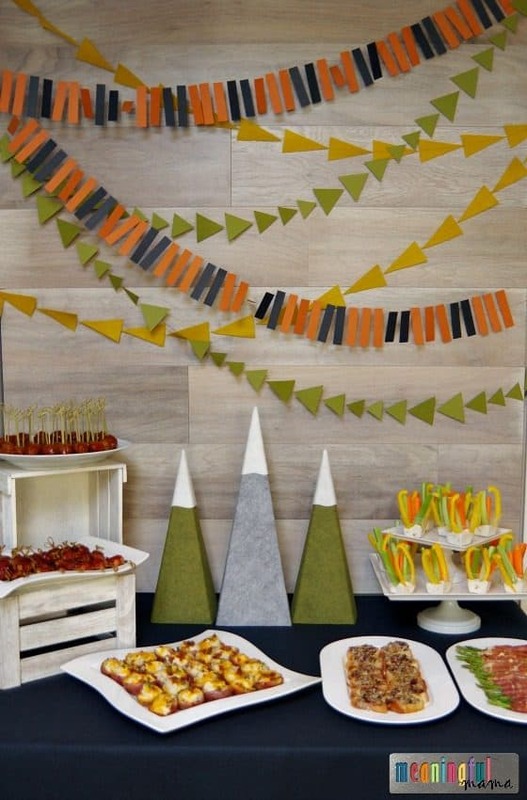 However, the green paper triangle points were hard to sew through, and we ended up not liking the line down the center for the rectangle paper garland. Therefore, we used a glue stick to sandwich two of the shapes together over thread. The felt ones we did sew. 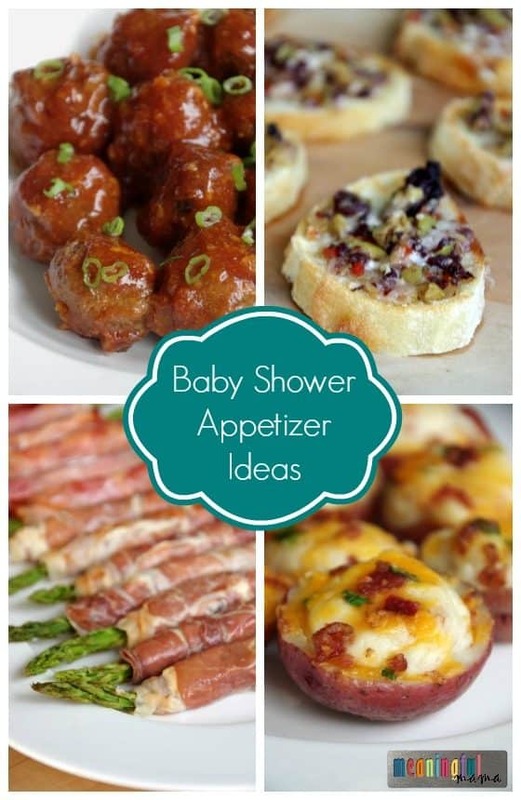 We did appetizers for this shower, and I will be sharing our menu as I get the different recipes up on my blog. We made meatballs, bacon wrapped water chestnuts, twice baked mini red potatoes, cheesy olive tapenade crostini, prosciutto wrapped asparagus and vegetable dippers. Yummy! The tables were covered in navy blue felt. Our mountains were set in the middle. 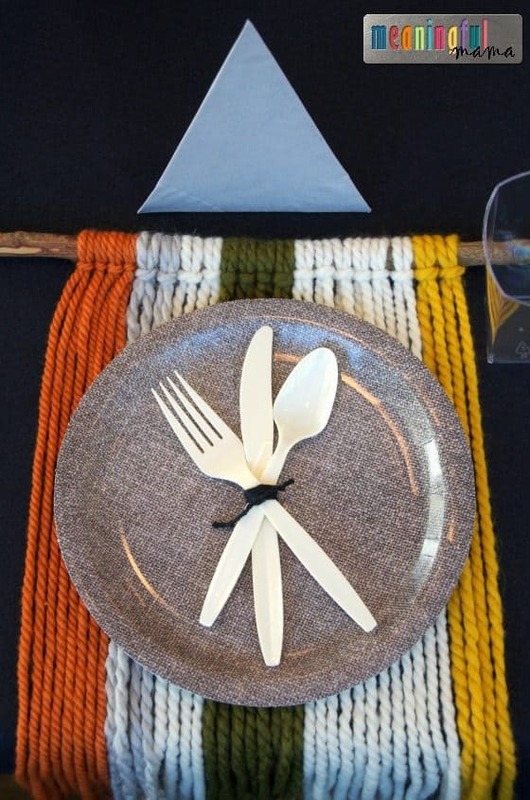 These yarn on sticks can be used as wall hangings, but we used them as placemats for our tables. They’re super easy to make. Simple double your yarn, wrap it around the stick and through the yarn loop. The sticks we collected outdoors and then cut to size. Sorry for the wrinkled napkin. 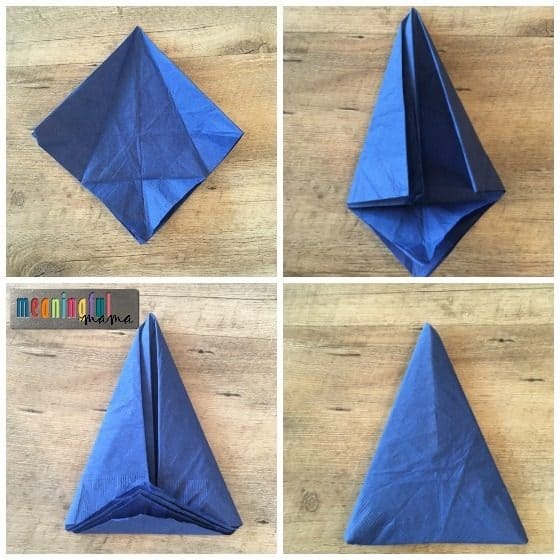 I was experimenting to see what would work to make the napkin look like a mountain. 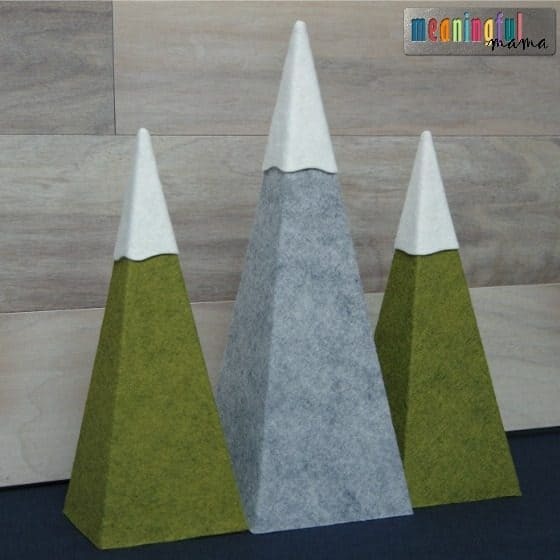 These stand up nicely on the table, which matched the shape of the mountain centerpieces. 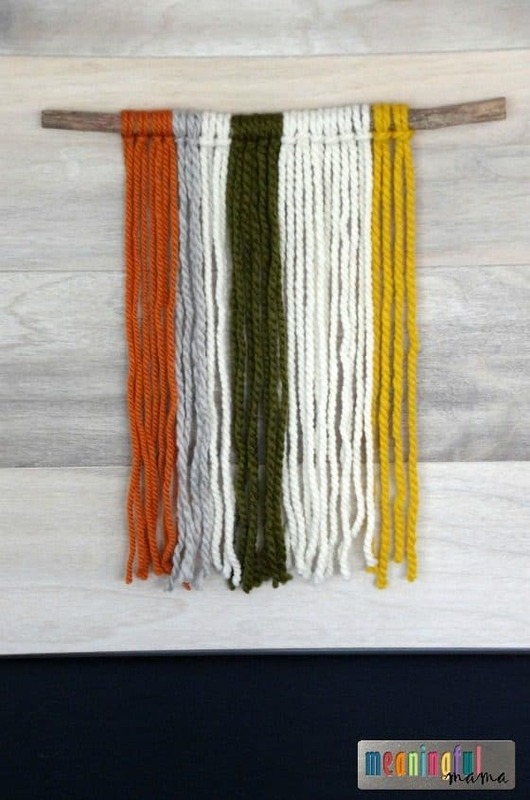 We were inspired by the yarn and stick design at the Good Times Home Store. 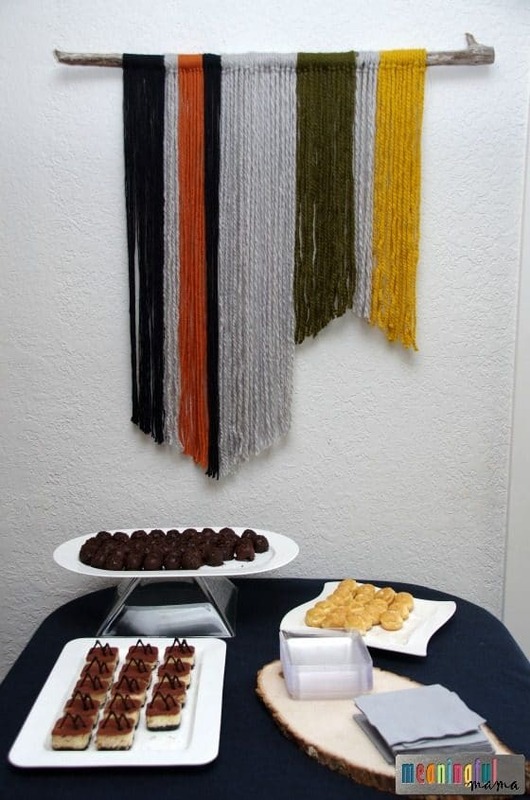 Our own yarn wall hanging mimics her design. For dessert I made mini-square cheesecakes. I found these mini-square cheesecake pans on Amazon. I used the Oreo crust from my peanut butter pie recipe. I only baked it for 3 minutes before cooling adding the filling. 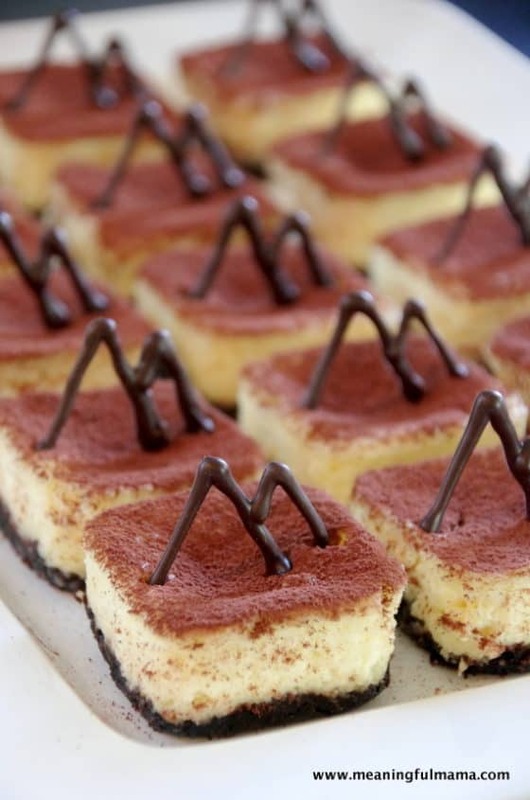 Here is my favorite cheesecake recipe. I made the chocolate mountain using chocolate candy melts . 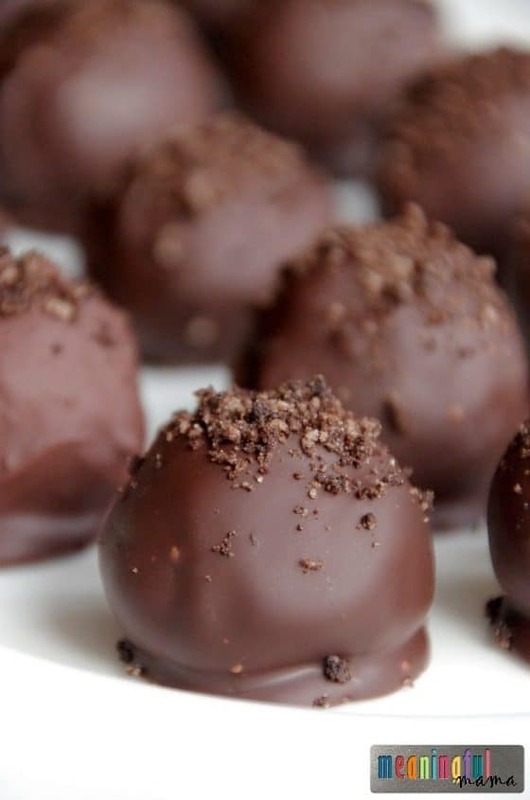 We served my, always-a-hit, Oreo Cream Cheese Truffles. We also served store bought cream puffs . 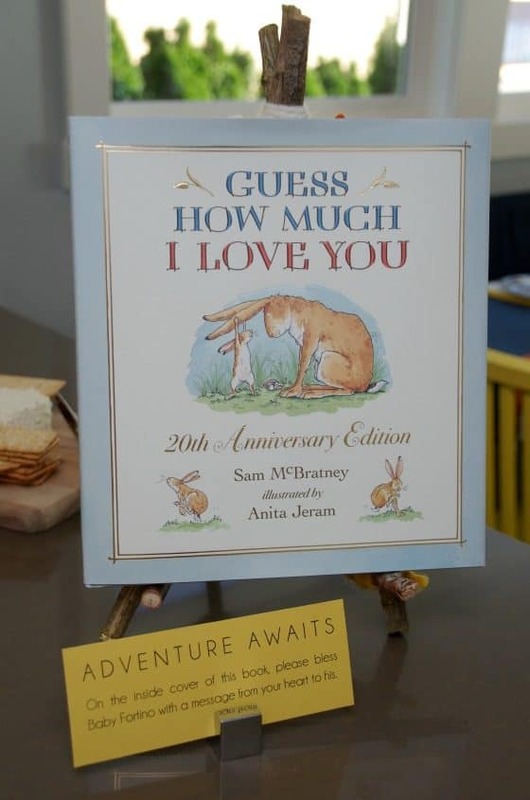 A wonderful memoir and activity for a baby shower is to buy the book “Guess How Much I Love You ,” and have everyone sign the inside cover with Sharpie. We made an easel out of sticks tied together with the yarn. What a wonderful keepsake. 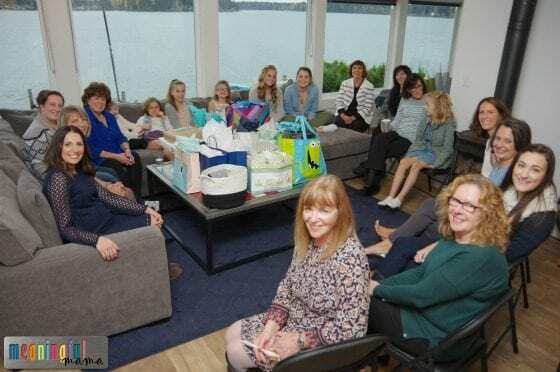 We also had people try and guess the date of baby’s arrival. 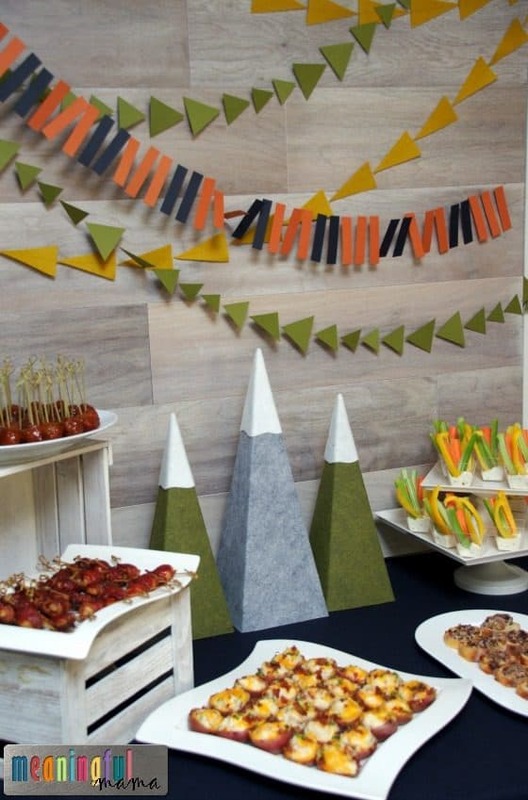 It was a fun mountain themed boy baby shower with tribal influence. 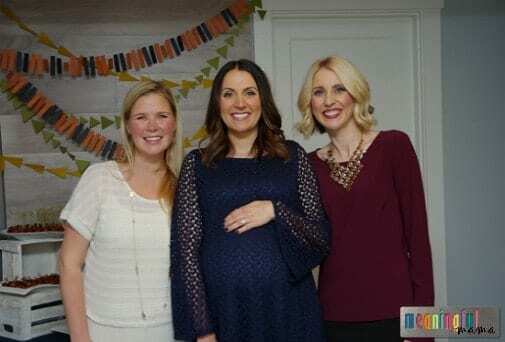 We are anxiously awaiting the birth of this boy. It should happen any day now. I’m excited to have a new nephew in the family.